Shrink tubes, Wire-wraps, Cable tags and more! 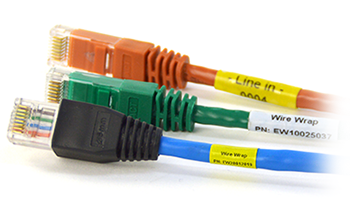 Explore our solutions for Cable identification and Wire marking! Cable identification and wire marking is an important and often challenging task. Finding the correct method and the correct materials to accommodate the size of the cable and to clearly show the necessary information can be a difficult task. The Rebo solution will allow you to create and print from one to multiples in up to three different types of cable identification /wire marking solutions. Rebo aim to offer a general range of everyday use cable tags and shrink tubes along with a wrap around, self-laminating cable label. We offer the most common sizes but can, on request, offer other sizes. Our shrink tube materials -also known as cable sleeves- are made of halogen free, flame retardant and low smoke heat shrinkable polyolefin tubing with ideal printability properties for identification purposes. Our advisor will help you pick the right type of shrink tube for your desired application. Request your FREE label samples! If you fill in your details below we will send you your label samples as soon as possible! Your sample pack contains a printed example of each of the below materials. Our transparent wire-wraps, also known as wrap around labels, provide a close-fitting, self-laminating coating that resists oil, water and solvents. Your cable coding will remain protected even under the most extreme conditions. The labels can be used for overhead and underground applications and are available in four different sizes so as to satisfy all your requirements. Rebo offers an extensive range of cable tags for many applications. Choose from tags that are untearable and tags that are resistant to blasting or high temperatures. Companies and government agencies are starting to get more demanding regarding to worker safety and efficient work processes. Contact us for any questions or advice, we can tell you all about the possibilities. Do you have any questions or need help with your project? Please fill in your details below!